Home / Resources / Count Us In! Toolkit 2019 / How to Use this Toolkit? This toolkit is designed to help you plan your involvement and enlist stakeholders who can help get the message out. You can start planning now for activities in September. We offer a variety of options for promoting good attendance. No school, community or organization should feel that it needs to accomplish all of them. Instead, choose which options work best for you and build the support you need to do more in the following year. This is a living toolkit that we anticipate will be revised and improved over time. 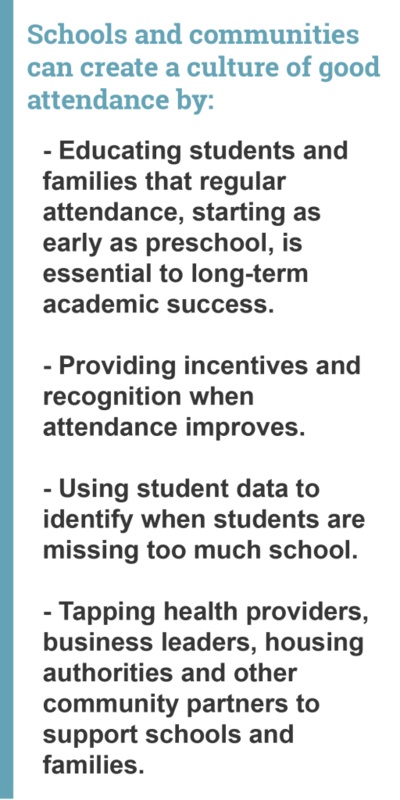 We encourage schools, partners and communities to contribute ideas for improving attendance and to share your successes. Submit your ideas, examples or question here. 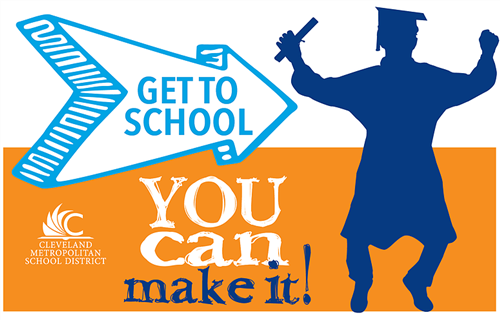 In Ohio, the Cleveland Metropolitan School District’s citywide campaign: Get To School – You Can Make It! significantly reduced chronic absence from 44 to 30 percent from 2015 to 2017. Led by CMSD CEO Eric Gordon and an attendance implementation team, the campaign, highlighted in this PBS NewsHour video segment, uses phone banking, canvassing, scholarship opportunities, celebrations, mentoring and more. Serving over 39,000 students, mostly from low-income families, CMSD has invested in a strong foundation of social and emotional learning practices and engaging community partners, including the Cleveland Browns players who hand-delivered uniforms to over 2,000 students. In Grand Rapids, Michigan, a community partnership of Kent School Services Network, Believe 2 Become, United Way, and county health, mental health and social services agencies came together to track chronic absence and intervene with the students, schools and communities most affected. Since implementing the innovative, district-wide Challenge 5 campaign three years ago, test scores have gone up along with a 25 percent drop in the Grand Rapids Public Schools chronic absence rate. Download Grand Rapids’ Disruptive Strategies for Change Making. Reversing Chronic Absenteeism in Grand Rapids from Believe 2 Become on Vimeo.